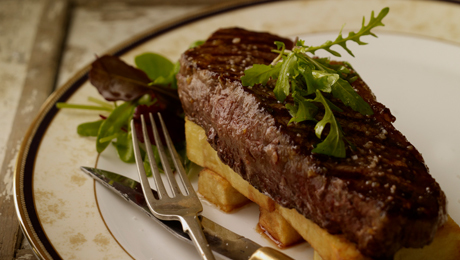 Naturally succulent and delicious, the Striploin has been the most popular cut for steaks. The Striploin is relatively lean, versatile and perfect to panfry, grill or barbecue. Place the thyme, rosemary and bay leaves into a large bowl with the black peppercorns and pour in the oil and mix thoroughly to allow the flavours to infuse. Place the striploin into the marinade and leave them to marinade for up to 2 hours or preferably overnight. Then in a small bowl, soften some butter with a spatula then add in a spoonful of marmalade and 2 tsp of Whiskey. Combine until smooth. Store in the fridge until required. Preheat the deep fat fryer to 160°C, peel the potatoes and cut thick chip size (1cm large), place in a bowl filled up with water to store until required. When required, place the chunky chips on a clean kitchen towel, and pat dry the excess of water. Place the chips into the first oil. Deep fry for 3 – 5 minutes without coloration . This step helps the chips to become fluffly and cook thoroughly. Remove the chips from the oil and increase the temperature of the oil to 190°C. When the oil is ready, place the chips back in the oil, and deep fry an other 4 – 5 minutes until crisp and golden. Remove the chips from the oil and place in a kitchen paper lined bowl (to absorb excess oil). Meanwhile, preheat a ridged griddle pan over a medium-high heat. Brush the steaks with 1 tbsp olive oil and season to taste with salt and pepper. Sear the steaks for 2 - 3 minutes each side (for a medium finish), or longer if desired. Divide the chunky chips between 4 plates, then place a steak on top. Add a spoonful of the whiskey marmalade butter and allow to melt over the steak.